The perfect compliment to your Garden Classic Table, our Elite Comfo-Back Outdoor Swivel Rocker Dining Chairs are sure to leave you and your loved ones sitting comfortably for hours and enjoying every outdoor occasion! Featuring a swivel base, constructed for strength that also allows for a very smooth rocking motion, this chair is the best of both worlds! Add our optional Sunbrella Fabric Cushions to add a touch of flair and an further enhance this chair's comfort! Check out the Berlin Gardens Cozi-Back version of the swivel rocker as well! 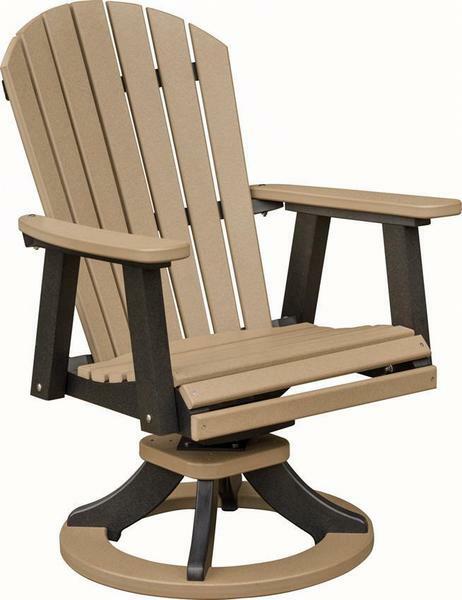 Each chair is handcrafted by skilled Amish woodworkers from an eco-friendly material called poly lumber. Poly lumber allows for a beautiful color that is uniform throughout the piece that will not chip, crack, rot, or develop mold and will require little to no maintenance, even when faced with the elements. This chair is truly built to last decades! Height to Seat - 18"
Base Width - 23 1/2"